Make plans to enjoy a Sunday Funday movie experience with the entire family. 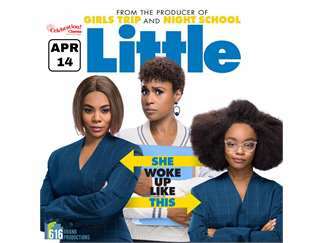 616 Grand Productions, a local events management and production company is hosting the Little movie premier and fundraiser to benefit New Destiny Pathways. The movie is starring Marsai Martin, Regina Hall, Issa Rae and Justin Hartley. Jordan (Regina Hall), a take-no-prisoners mogul, torments her long-suffering assistant (Issa Rae) and employees on a daily basis. She soon faces an unexpected threat to her personal life and career when she magically transforms into a 13-year-old version of herself (Marsai Martin).